Pennsylvanians like myself tend to give New Jersey a hard time in all things, and beer is no exception. Of course, this sort of attitude is kinda like high-school-style posturing and is probably not all that true. Still, while they've got some mainstay breweries like Flying Fish or longtime specialty breweries like Ramstein, it used to be an otherwise unexciting beer destination. But lately, there have been a few newer breweries making waves, like Kane and Carton. 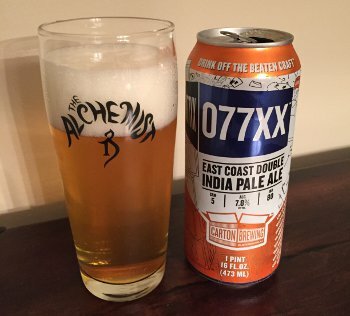 Beer Nerd Details: 7.8% ABV canned (16 ounce). Drank out of a Willibecher glass on 9/19/14. I'll have to get around to reviewing some of Carton's other stuff. I've had many a Boat beer, but never reviewed. I've also had Epitome, a decent and powerful black IPA that I'd like to try again at some point. And I've had a few others that don't seem as common (I had a sip of a friends coffee IPA the other day, not really my thing, but well made). And, of course, I really need to get out to Kane sometime. And I'll have to stop giving New Jersey a hard time about their beer. With beers like this, that'll be easy. Glad you enjoyed. :D Heehaw. I most certainly did. Thank you again for muling, you are the bestest! This page contains a single entry by Mark published on September 22, 2014 11:38 PM. Foley Brothers Native IPA was the previous entry in this blog. Cascade Blueberry Ale is the next entry in this blog.